I really don't understand the outrage sparked by the amount of theory papers on the di-photon resonance? What's the big deal? There is a speculative signal out there and people are working on it. If you ask me, this is much better than adding another prefix to MSSM or mentally masturbating about the holographic principle in 2+1 dimensions. Are people concerned that there are too many crappy papers being put out just for citations? As far as I can tell, about 50% of the papers so far are crap and the other 50% are solid particle phenomenology. This is about the same percentage as on any di-photon-less day on the arXiv. As long as the paper is good, I don't see a problem with chasing citations either. Unfortunately, we live in a super-competitive field of particle physics with O(10) real, permanent jobs each year where citations count a lot (even though they really shouldn't, at least not that much). How can you blame someone for chasing citations then!? I agree that people writing papers about this is not a problem, though the speed with which the papers appeared was pretty laughable. What is really disturbing is that it is obviously so easy to come up with an explanation. As they say about religions, they can't all be right, but they can all be wrong.... the other disturbing thing is how boring all these papers are. Do we really want to have to start thinking about sgoldstinos? Is that a prospect that makes your pulse race? Do we really want something like technicolor to rise from the grave? YAWN! Holy cow, Rastus, if you're not excited by the possible discovery of the sgoldstino and what it implies you probably chose the wrong job. Jester, should we conclude from the plot that we should expect another explosion at the LHC? Kal, i agree except that i think the citation thing is becoming a bit of a problem. In science, citation count is used as a value estimator. It's of course imperfect, but normalized to each discipline and integrated over long time and many papers it does a decent job. However, in cases like this, a handful of papers that would look bad even on Twitter get the same number of citations as good ones, which skews the system. This is the fault of our citation culture that allows for mass grave references and citation whining. The risk is that our citation count will become meaningless, just like authorship has become for HEP experimentalists. Whats the likelihood that the 2TeV signal would come back in a longer run? It's not conclusive yet, but the best-fit cross section to the 2 TeV ATLAS diboson excess is excluded by the 13 TeV analyses. Fair to say it's not exciting any more. "the Standard Model - that we know is certainly not the final theory because it cannot account for dark matter, matter-antimatter asymmetry, and cosmic inflation"
I appreciate this blog very much. Hence I advise to skip "dark matter" and "inflation" from this list, there is still hope for them within the SM, and to add: the values of the 30+ constants of Nature. theon55, SM DM and inflation? How?? Inflation and Dark Energy are likely due to the Higgs field as phi changes value; Dark Matter and Matter Asymmetry are likely due to the physics of massive neutrinos. (1) Inflation is likely just due to the Higgs field at high values of phi (the scalar field energy). The shape of energy density in the Higgs field looks amazingly similar to the field that would be required in single-field, slow-roll inflation models that fit all experimental data within a few sigma. In addition, we already know that the Higgs field couples to the known particles, so particle creation at the end of inflation is not ad-hoc. (2) If the Higgs field is the inflation field, then the averaged energy density of the field near the minimum of the potential might just be what we call "dark energy." While most models of the Higgs field have the energy density go negative at a value of phi = 246 GeV, this seems somewhat arbitrary. So, we might as well be just as arbitrary and make the value at the minimum of the Higgs potential go to the value needed to describe dark energy. We would then have V(phi) always positive, and we could test this theory against experimental data on the shape of the primordial scalar and tensor fluctuations from CMB data. (3) There are still 3 (or 6) particles which we haven't found within the "standard model (after including neutrino mass)". These are the three (or six) sterile neutrinos that are mixing-partners of the six active neutrinos (3 families times 2 options for particle vs, anti-particle) because massive neutrinos implies that left handed particles can convert into right handed particles. It is possible that some of these sterile neutrinos could be the dark matter of the universe if their mass were somehow larger than the mass of the active neutrinos and/or if their velocity were somehow much colder than the relic active neutrinos. (4) The asymmetry of matter and anti-matter can be fully achieved within the standard model of particle physics if we discover a sizable CP violation within the neutrino sector. The latest data from neutrino detectors suggest a sizable (near maximal) value of CP violation, and hence, this could be the cause of the matter/anti-matter asymmetry in our universe. It seems to me that the Standard Model is not so well known as some physicists like to describe it. 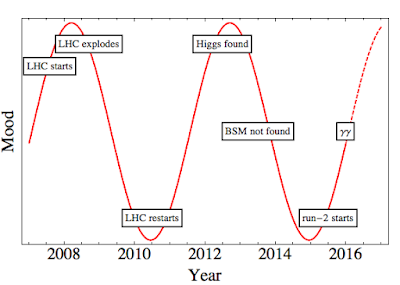 For example, there is still fairly large uncertainty on many of the parameters within the Standard Model (top quark mass, Higgs mass and self-coupling, neutrino masses, neutrino mixing angles, neutrino CP violation, and sterile neutrino mass/mixing angles) that many of the big problems could still be solved within the Standard Model+Massive Neutrino Physics. Eddie, Higgs inflation is dead. You seem to be overly optimistic in your assertions. Sterile neutrinos (if they exist)are definitely BSM physics. No robust proof on the DM-sterile neutrino connection has been established, at least as of today. CP violation in the neutrino sector cannot easily account for CP violation in the (heavy) quark sector. The Higgs phenomenology is still riddled with many open questions, naturalness is still a puzzle, SM does not explain the source of physical parameters, why there are three gauge groups, why the g-2 anomaly and so on. One thing of interest about the 750 Giga-papers is that any of those can be right - plus certainly more to come. And this is proof that we understand nothing about the real thing! The proof is independent of the existence of the 750 Giga-stuff. Thanks for the posts Jester. "Kal, i agree except that i think the citation thing is becoming a bit of a problem. In science, citation count is used as a value estimator. It's of course imperfect, but normalized to each discipline and integrated over long time and many papers it does a decent job. However, in cases like this, a handful of papers that would look bad even on Twitter get the same number of citations as good ones, which skews the system. This is the fault of our citation culture that allows for mass grave references and citation whining. The risk is that our citation count will become meaningless, just like authorship has become for HEP experimentalists." Not sure that I agree. Papers that have the potential to explain actual data of more than trivial statistical significance that could point to BSM physics have a lot more intrinsic value than papers that consider random BSM physics possibilities that have no corresponding experimental motivation. People are publishing fast and furiously (my guess is that we have a couple hundred authors so far which is a very large percentage of the pool of people who the skill set to write such articles), because they recognize this fact. Mobilizing the community of phenomenologists around an issue, even if it ultimately turns out to be a false alarm, is a worthwhile thing and also a good natural experiment to demonstrate how much group think or diversity there is in understanding potential BSM physics in the community, because almost every major or minor approach within the field has been invoked. If I'm not mistaken, the Nobel Prize was awarded just last month for discovering physics beyond the standard model. And let's not pretend that neutrino oscillations are standard model physics. Unless you can tell me the additional fields that need to be added to the standard model to accommodate mass (right-handed neutrinos with Yukawa couplings? heavy Majorana states?) you don't know what the right way to modify the standard model is. And we don't know that. Neutrino mass opens up a hole in the standard model that we don't know what to fill it with yet (although we of course we have ideas). Sorry, but this is a pet peeve of mine. Which is the "significant deviation"? Anon 20:30, i don't think it's the same paper all around. Many different production (direct, heavier resonance, associated, non-resonant,...) and decay (2-photon, 2-photon+MET, 4-photon, ... ) mechanisms were studied, and embedding in multiple frameworks (MSSM, 2HDM, strong interactions, dark matter, composite Higgs, hidden valley, ...) were discussed. The problem is rather opposite, namely that at this point almost anything goes, and numerous phenomenologically distinct options are still left on the table. Would the citation system survive if we were not obligated to cite any paper that is not *directly* relevant to our work? 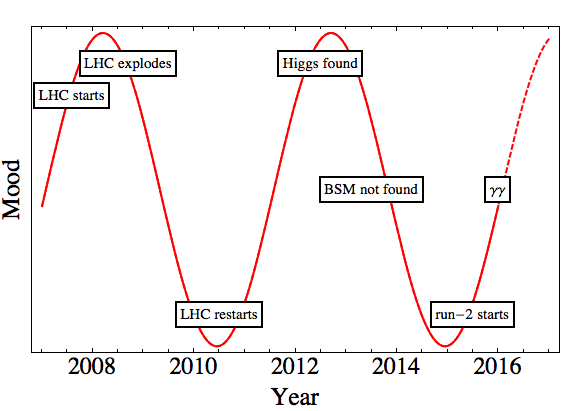 The diboson anomaly is not dead. In the diboson case, the background arises from gluon scatterings, and the possible signal from quark scatterings, so going from 8 to 13 TeV the background increases more than the signal. The opposite is true for the diphoton anomaly. Anon 17:01, yes, that would be the idea :) However, the practice is different currently, and evolving in the wrong direction. We can all look forward to 6 months of speculation, theorizing and earnest debate. Then, dreary reality will set in or the first glipse of new physics will be confirmed. I haven't been this excited since I saw my first Quark*. "The problem is rather opposite, namely that at this point almost anything goes, and numerous phenomenologically distinct options are still left on the table." That is a fascinating take, given your original post on the subject: "[...] Variation of this minimal toy model will appear in a 100 papers this week." At least some of those papers are useful, because they lead to interesting things to check for experimentalists. Take the idea that the diphotons could actually be two pairs of collimated photons, for example: that is something the experiments can check, but the idea has to come up in the first place. Obvious things like additional missing transverse energy, additional visible activity in the events and so on have been checked before, of course. A colleague recently pointed out to me that 1512.04933 made a replacement on the arXiv about 3 weeks after their v1. In the v2 it turns out they generously rewrite the paper, and also introduce a number of results which were not in the v1. But after reading carefully, the case of 1512.04933 is even more embarrassing. The new content they introduce (DM, RG perturbativity, photon fusion...) had been pointed out by other authors just a few days after their v1. Now, in 1512.04933, they *do not* refer to these authors as if they got it right first: they refer to them in a "note added" after the conclusion. That's usually what you do when your result was already in the v1 and your concurrents got the same almost simultaneously, so that everyone should share the credit. What essentially happens is they claim ownership of other people's results, so they get a share of credit for other people's idea. Seriously, isn't that a case of plagiarism? I am sure some people may turn a blind eye to this kind of practice. Then I would really want to ask those: Would you do the same if these authors were some unknown people from a third-world country instead of reknown people from cern? Basically every 750 paper has changed substantially between v1 and v2. There is no question it is a bad practice to submit an incomplete v1 (who casts the first stone...). However, as long as the later paper that inspired the changes are cited, I think there is no case for big words. If this had been the first of the 750 papers, would it have stopped the flood? I have experienced before the bad acausal practice pointed out by toofhtoum and it is not nice to see your results presented as new in a posterior replacement. I disagree with "However, as long as the later paper that inspired the changes are cited, I think there is no case for big words." If you are inspired by the later papers, you publish your new results in another paper. Or you hold the submit button as long as you can not to miss anything important. It is sad to see that integrity is gone. A preprint by Davis, et al., casts real doubt on the reported local significance of the ATLAS 750 GeV bump, arguing that it is really just 2 sigma and that the calculation of the margin of error in the background made by ATLAS was artificially low because it involved a formula that gave undue weight to the Run-1 data and insufficient weight to the Run-2 data at higher energies. If this analysis is on the mark, then the whole exercise has really been much ado about nothing. - DM abundance has been computed in a model-independent way in terms of widths. - gamma gamma production predicts a (13 TeV)/(8 TeV) ratio lower than what suggested by data and with a small theory uncertainty. A bound state of 6 Higgs? A Higgsagon?